As the old saying goes, there’s never a good time to be involved in a zombie epidemic. Still, the noughties have proved to be a particularly poor era to try and escape ravenous legions of the undead. Almost every zombie film previously, from 1932’s genre grandfather White Zombie, through George Romero’s Dead series, to even 1998’s Scooby-Doo on Zombie Island, featured reanimated corpses with all the athletic ability of a heavily-stoned teenager. 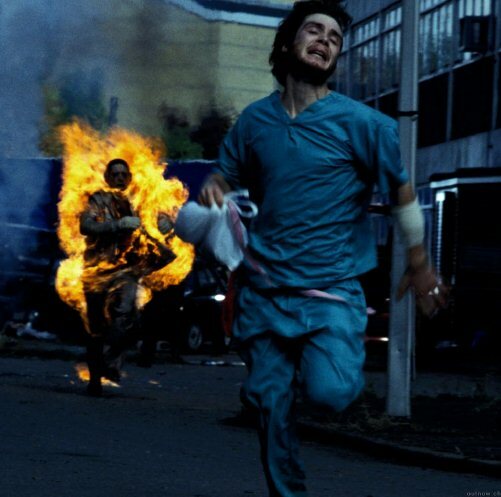 But, Danny Boyle’s 2002 post-apocalyptic Britflick, 28 Days Later, dug up a new breed of zombie, capable of doing more than simply moaning, shuffling, and snaffling the odd brainstem; the walking dead became the running and jumping dead. Of course, the old breed isn’t simply going to shamble off into the darkness and peacefully rot away. Instead of replacing their graceless brethren wholesale, the introduction of the so-called ‘fast zombie’ has merely stratified the cinematic world of the undead into two camps. But, despite the protestations of supporters of the older model, the fact is that the fast zombie has changed the entire dynamic of the genre. Whereas previously the undead were little more than stumbling sacks of semi-rotten meat, only posing a legitimate threat in large numbers, Danny Boyle’s reimagining has shifted the decaying hordes from subhuman to superhuman in the blink of an infected eye. Rather than a slow, lumbering force to be outsmarted, the new breed are powerful, tireless, and not quite as dumb as their decaying predecessors. This shift, from a lone zombie being almost a figure of ridicule – the pie fight scene in Romero’s Dawn of the Dead is the greatest example of this – to a terrifyingly physical threat, was memorably ushered in by the opening scenes of Zack Snyder’s 2004 remake. In Snyder’s frenetic vision of the apocalypse, even the least intimidating human can be transformed into a fearsome killing machine, as shown when the lead character’s husband – a strapping, six-foot-plus bear of a man – has his throat torn out by the teeth of a seven-year-old girl, who then proceeds to attempt to break down an oak door like a pre-pubescent battering ram. But, somewhat fittingly, the majority of the post-28 Days Later breed aren’t, in the strictest sense of the word, zombies at all. Rather than the reanimated husks popularised by Romero, the new strain are largely the result of viruses – a prescient reflection of the fear of shadowy corporations and biological weaponry so prevalent in the present age. From Juan Carlos Fresnadillo’s sequel to Boyle’s genre-divider, 28 Weeks Later, to the low budget Spanish horror Rec, Canadian indie-flick Pontypool, and the comedic Zombieland, viruses are now the zombie apocalypse instigator-of-choice. 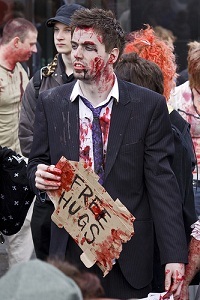 As such, instead of Romero’s Dead series playing on the spiritual result of the world’s moral bankruptcy – ‘When there’s no more room in Hell, the dead will walk the earth’ – many of the new breed of zombie flicks play on our fear of closed-door science, on the notion that monolithic, faceless corporations may be attempting to replace the very Gods whose influence they have eroded. 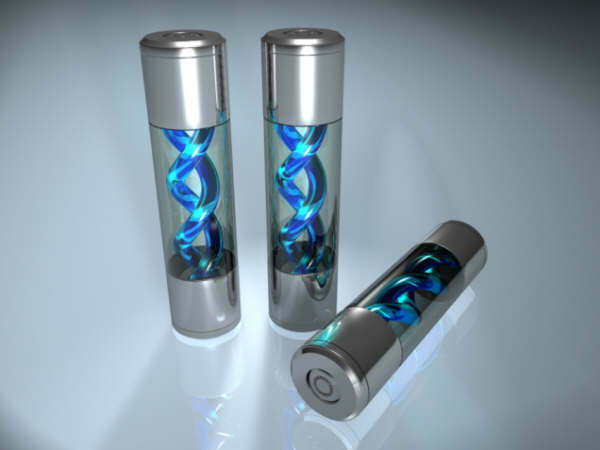 With spirituality large ly demystified, we have moved on to a new and, for the majority, similarly unknowable source for our nightmares – genetic science. 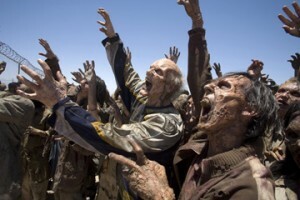 Even so, this change hasn’t altered the key appeal of zombie films as much as you might think. 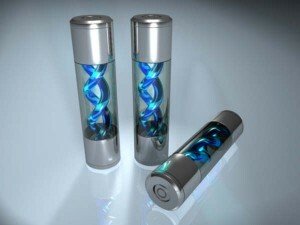 After all, as Arthur Clarke, the English physicist and science-fiction author, put it, ‘any sufficiently advanced technology is indistinguishable from magic.’ Scientists are the sorcerers of the 21st century – black magic practitioners who cast their spells with syringes and beakers rather than hexes and chants. As such, if the older, slower zombie is a complex metaphor for destructive self-absorption and decaying morality, then the new zombies are a symbol for a feeling of powerlessness in a world that is continually moving, like the sprinting, snarling undead themselves, at what seems like a hundred miles an hour. What Pegg sees as a sacrifice of dread for shocks in the new breed of zombie movies is merely a reflection of the world in which they have been created – influenced more by the realms of videogames and internet nasties than the Haitian Voodoo myths and lumbering monsters of the studio era. Rather than, as Romero suggests, losing their reason for being, the new batch of zombie flicks have harnessed the fears of their own age, transmitting them through the familiar, and yet still terrifying, imagery of their decaying forebears.